Know how to stop grinding your teeth! Bruxism or grinding one's teeth at night is a condition that can result in disrupted sleep, headache, teeth damage and can also affect jaws resulting in hearing loss or even change the appearance of one's face. 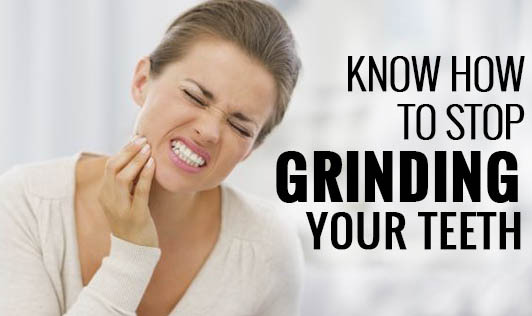 Teeth grinding can be caused by stress and anxiety or by an abnormal bite or missing or crooked teeth. • If stress is causing teeth grinding, attend a counselling session to learn ways to keep stress level at bay. Learn relaxation techniques such as deep breathing, yoga etc. • Cut back or avoid foods that contain caffeine such as chocolate, colas and coffee. • Avoid alcohol as it intensifies teeth grinding. • After dinner, go for a walk. The mild activity will help you relax and digests food better. • Avoid chewing gum if you want to stop grinding your teeth as research has shown that repeated movement of the masticatory muscles could generate a reflex that can be reproduced at night. • Avoid watching TV or listening to music before falling asleep. Avoid using your phone or computer before sleep as these devices can disrupt your sleep pattern which can make you grind your teeth at night.